Where did this paper go wrong? 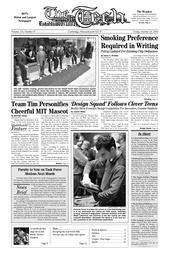 While some articles excel at taking advantage of MIT’s amazing ability to attract notable persons from all over the world and hear their thoughts in an informal setting, like the recent interview with the Prime Minister of Trinidad and Tobago, others fail, like the interview with Jeff Bezos, the CEO of Amazon.com, “Bezos: Pimp My Segway” (Oct. 17, 2006). What is most disheartening about this interview is that right now, very exciting and interesting events have been taking place at Amazon.com. While I reveled at the mention of the Badonkadonk tank, I was incredibly disappointed with the interview as a whole. In the last few months Amazon.com has started a new service where they rent out their computing power, a move that (unfortunately) smacks horribly of the “bandwidth trading” market that Enron was trying to create before their fall. These services are wildly different, but the mere comparison would have gotten Jeff Bezos talking. Wouldn’t it have been cool to find out how this enterprise is going? Ask him how Amazon might supply discounts for universities or groups working on large-scale projects like Folding At Home or Einstein At Home? Furthermore, Amazon’s new Unbox service (for downloading movies) along with iTunes movies have incited an amazing amount of controversy when Walmart, the largest retail chain in America, threatened to stop selling a distributor’s movies if it sold them on these services. There were so many serious questions that could have been asked whose response would not have been filtered through multiple memos and a dry press release released by the public relations department of Amazon. It’s hard to be both lighthearted and serious in one single publication. The Tech should not try to be. We have an amazing opportunity here at MIT to ask questions of real substance to those people that visit. I know that The Tech won’t be able to ferret out ground-breaking answers to questions of earthshattering importance. But with a little work you can get answers to questions the average Joe isn’t likely to ask. The reputation of The Tech will only increase if The Tech’s staff treat it with the respect that a newspaper deserves. I heartily laud Mr. Wyne’s imploring message to fellow Muslims in his Oct. 13 opinion column, “One Muslim’s Message to His People.” As another proud Muslim, I also believe that we Muslims should first become responsible for our own actions and be able to respect ourselves before we can expect this same respect from other communities. I also concur that as young Muslims we should honor the legacy of our faith, and for the sake of our ummah and the world at large, we should think now, of what we can do to re-build bridges and assume a place in civil society. As MIT students living in the Western world, as the intellectuals of today and tomorrow, we no doubt have a large burden on our shoulders, but we are also in an optimal place to re-start Mr. Wyne’s revolution of the pen and heart.